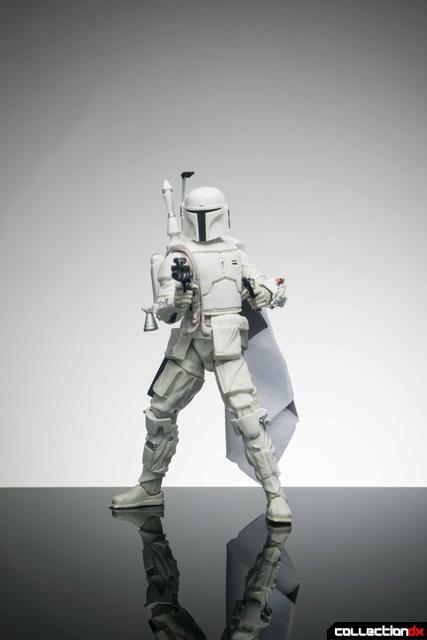 Released as a Walgreens exclusive, the Star Wars Black Series Prototype Boba Fett is Hasbro’s take on the iconic Star Wars bounty hunter in his original screen test appearance. 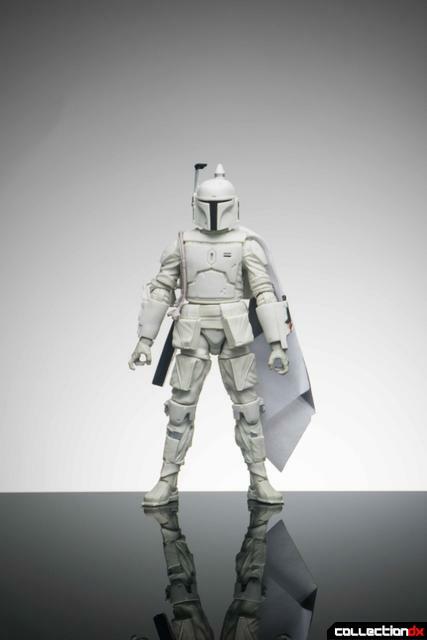 Prototype Fett comes with the same window box packaging as all the other 6in Black Series figures. The design is simple but I like it. 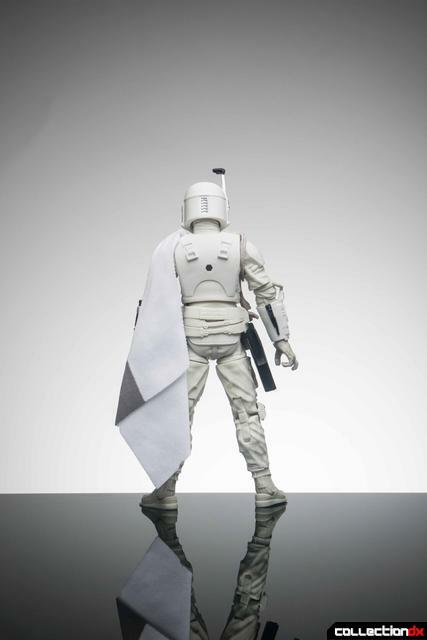 The figure is identical to the normal Boba Fett released in the 6in line except in a nice white color scheme. 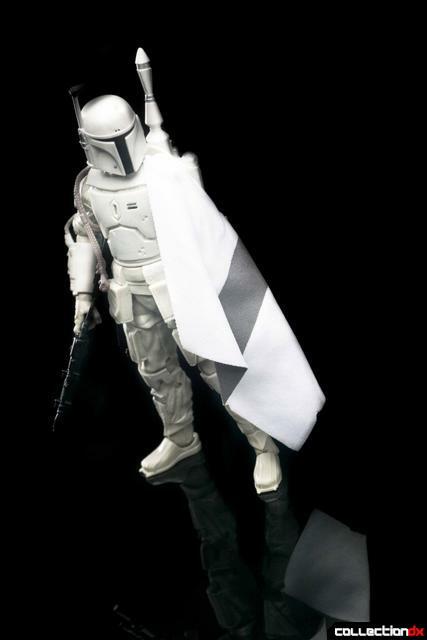 The cloth cape is also a nice touch and works better than a bulky moulded cape over the shoulder. 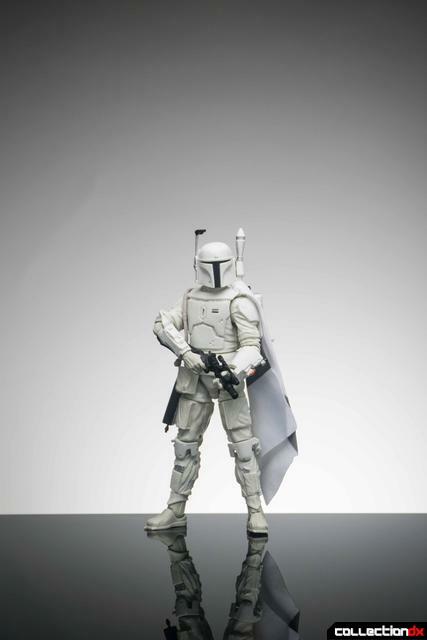 I know the figure is only a straight up repaint, but I really wish Hasbro had removed the dent in the helmet. It takes away from the nice clean aesthetic of the armor. 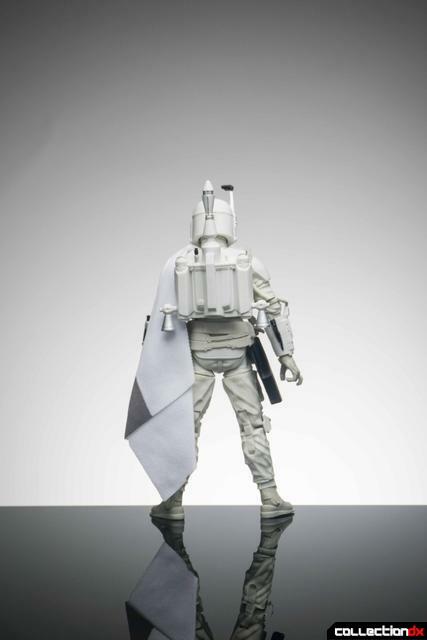 The jetpack can be removed and pegs into the back with two additional grooves to keep it from moving around. 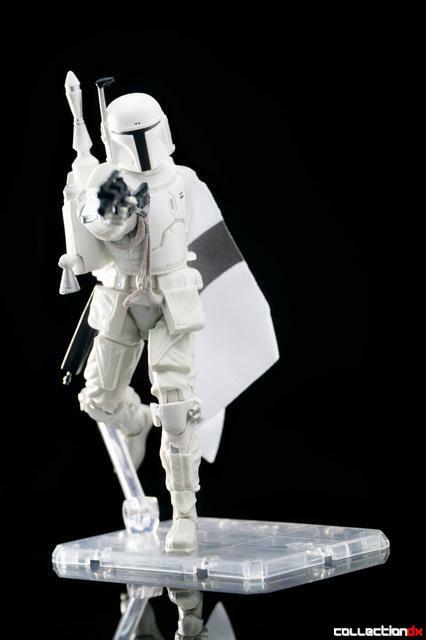 The figure doesn't have many accessories, but included is the jetpack, Sacros K-11 pistol and EE-3 Carbine. 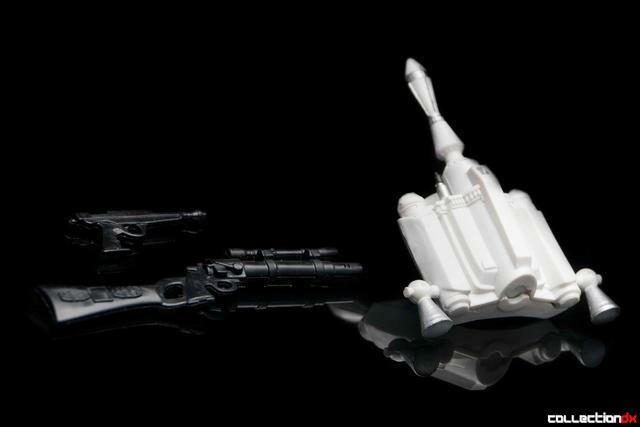 One minor annoyance is that the carbine's pistol grip is a big wider than the K-11's, causing the hand to stretch out a bit. 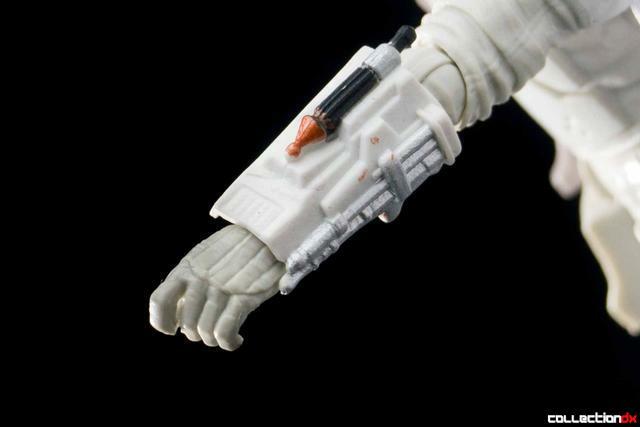 This makes the K-11 rather loose in hand if you decide to use the same one for both weapons. The wire on the right forearm is also a little concerning as it may break eventually. 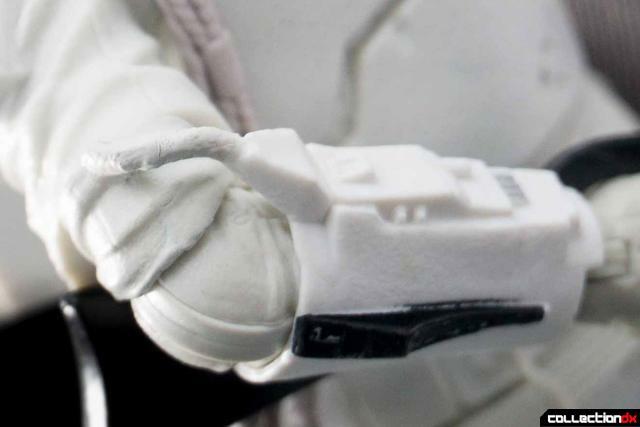 The left forearm has the rockets and flame thrower moulded in. Unfortunately mine has some QC issues with copper paint splotches on the forearm. For some reason the utility belt was designed with the large pouches in the front instead of the sides like the original design. 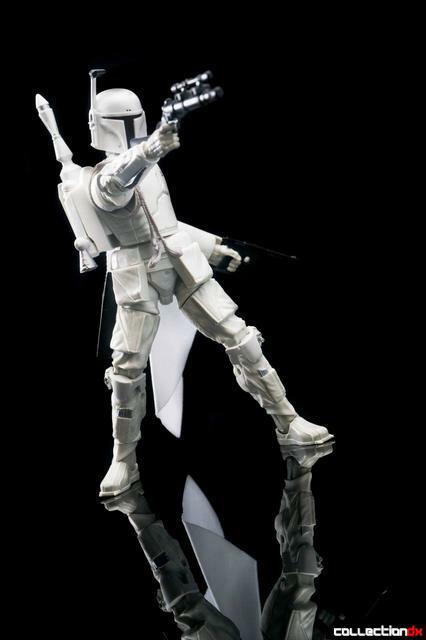 This causes the pouches to restrict the forward motion of the legs. 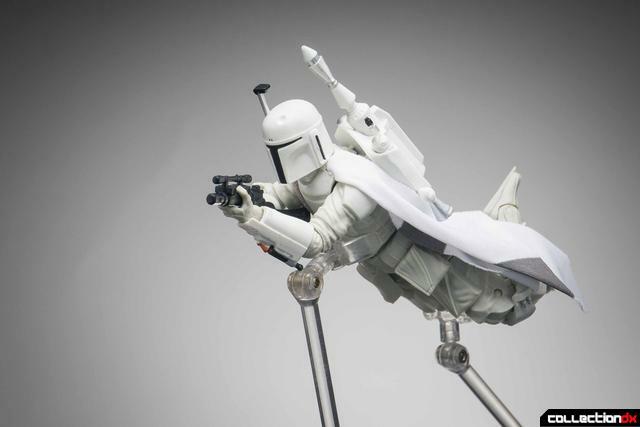 I would have preferred they move the pouches to the sides and the holster on the legs to give the legs a better range of motion. 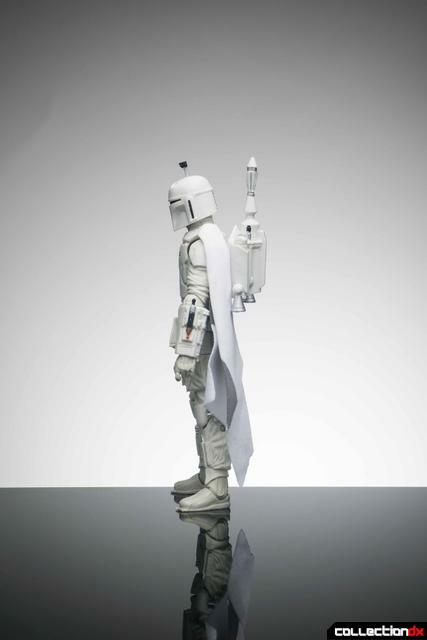 I've shied away from the Black Series figures for the most part but the white color scheme of prototype Boba Fett really appealed to me. 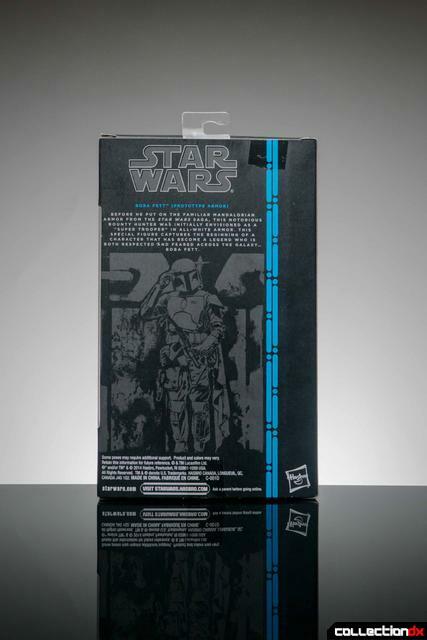 The figure was initially released just one per case, causing prices on the secondary market to sky rocket and making it extremely difficult to find in stores. I had given up on finding one until I had heard that Walgreens was receiving entire cases full of the figure and easily found my nearest store to have multiples in stock. 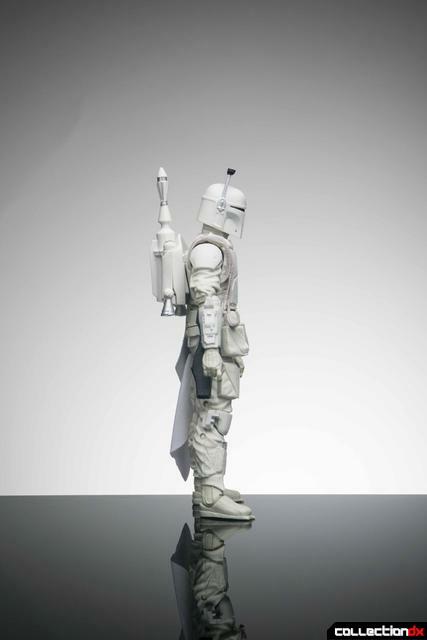 Prototype Boba Fett is an extremely solid figure that looks awesome and photographs great. While I had some small QC issues and slight annoyances with the utility pouch and helmet dent, I still think the figure is a great figure. Wow! 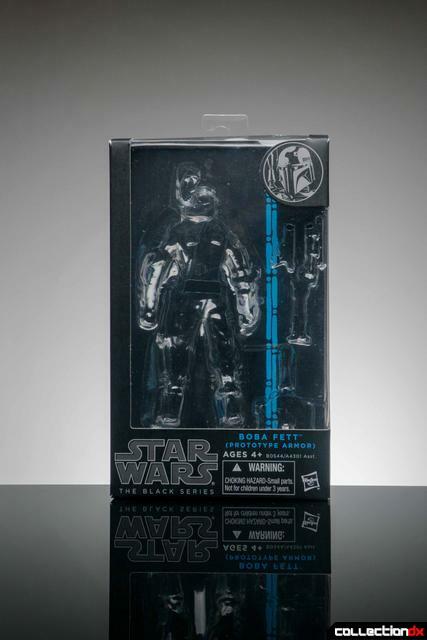 The precisely lit white backdrop and reflective black surface complement the toy perfectly. I really love how you set and shot this. The pics are wonderful, it really has that "showroom" feel, or maybe a fashion advertisement. 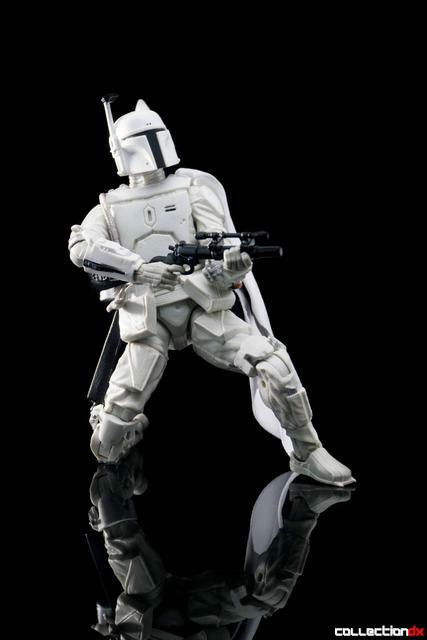 The one thing I wish about this toy is that it came with the McQuarrie helmet variant with the narrow visor and the mouth nozzles. 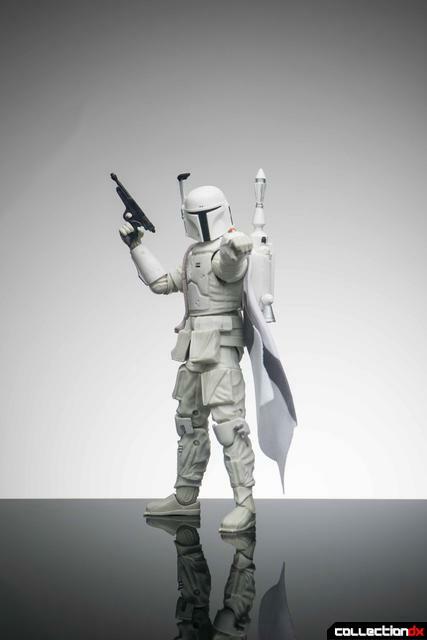 I know, this is based on Johnston art, and obviously they're not going to remold the whole body like they did with the 3 3/4" McQuarrie Fett, but still, I think that head would go nice on the all-white body and make this one stand out a bit more from the regular Fett on a shelf. 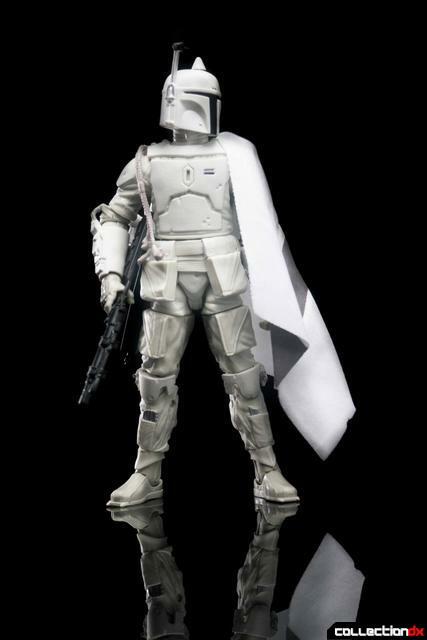 On the one hand, the all white works because it makes it look like he's an elite Stormtrooper. 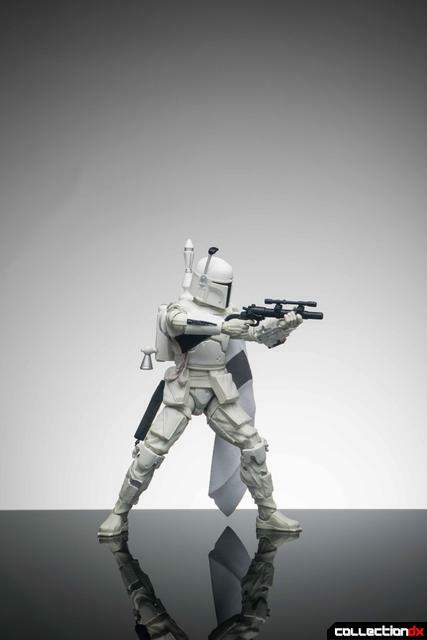 At the same time, I see why the color was changed because it makes it look too much like a Stormtrooper.